Tensions between the Islamic Republic and the Arab world deepened in 2015, exacerbated by the wars in Syria, Iraq and Yemen. President Hassan Rouhani’s top priority after securing the nuclear deal in July was to improve relations with Tehran’s neighbors. Iran made limited progress in upgrading ties with its neighbors in South and Central Asia. But overall, Shiite Iran instead was isolated, especially as Sunni nations increased cooperation among themselves. In 2015, Iran sent more Revolutionary Guards (IRGC), including top generals, to help Damascus fight both rebels and extremist militant groups, including the Islamic State (ISIS) and the Nusra Front. Brigadier General Hossein Salami told Iranian state television that Iran was helping Syria build a new force with recruits from Iraq, Afghanistan, Lebanon and Pakistan. But the intervention took a growing toll. Iran lost at least four IRGC generals in Syria in 2015. From October 1 and December 15, IRGC combat fatalities reportedly totaled more than 100. By October, Syrian President Bashar al Assad had the advantage in the balance of forces against the rebels, according to General Joseph Dunford, chairman of the Joint Chiefs of Staff. He estimated that less than 2,000 Iranians were operating in Syria. But Iran also organized militiamen from Afghanistan, Iraq, Pakistan and other countries to aid Syrian government troops. The Fatemiyoun military division, composed of Afghan refugees living in Iran and Syria, was reportedly the second largest foreign military force fighting for the regime, after the Lebanese Shiite militia Hezbollah. But Tehran also appeared interested in diplomacy on Syria. 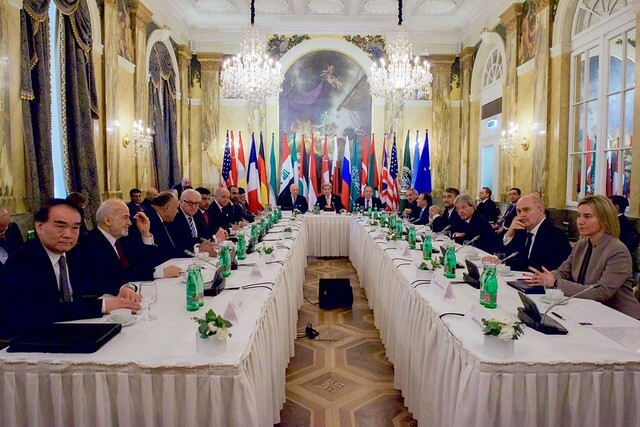 Foreign Minister Zarif and a delegation of Iranians joined peace talks in October. Representatives from 17 countries, the United Nations, and the European Union participated in the talks. The decision to include Iran, backed by the United States, marked a major change after two earlier failed peace initiatives in 2012 and 2014. They held a second round in November. For Iran, the two key issues were the fate of President Bashar Assad and the role of the opposition. The Syrian president “is the Islamic Republic of Iran's red line because he was elected president by the Syrian people,” said Ali Akbar Velayati, the supreme leader’s foreign policy advisor. Tehran views many of the rebel militias, some backed by the West, as terrorist groups. After ISIS came within 25 miles of Iran’s border in January 2015, Iran deployed more military advisors to Iraq to help fight the extremists. In March, General Qassem Soleimani, commander of the IRGC’s elite Qods Force, directed an assault by Iraqi military and Shiite militias in Tikrit. Tehran touted its role. Pictures of Soleimani on the frontlines were widely shared on social media. In October, General Dunford said that there were more than 1,000 Iranian troops in Iraq. But Iran also suffered losses of senior personnel in Iraq. An IRGC commander, Reza Hosseini Moghadam, was killed by ISIS snipers in Samarra. Jassem Nouri, a seasoned commander who served in the Iran-Iraq war in the 1980s, was killed near Ramadi. A Qods force commander close to Soleimani, General Sadiq Yari, was killed while fighting ISIS in Tikrit. Relations between Iran and the Sunni sheikhdoms in the Gulf soured further in 2015. New Iranian outreach to the Gulf nations failed to stem the slide. In September, the Gulf Cooperation Council countries —Bahrain, Kuwait, Oman, Qatar, Saudi Arabia and the United Arab Emirates —accused Iran of interference in their domestic affairs by harboring fugitives, supporting terrorist groups and inciting violence. Shiite Iran and its Sunni neighbors also supported rival actors in the Syrian and Yemeni conflicts. In a sporadic war of words, Tehran accused Saudi Arabia of supporting terrorist groups, including ISIS and al Qaeda. Riyadh accused Iran of sending thousands of militants to Syria, further fueling Shiite-Sunni tensions. Riyadh countered that Iran was responsible for exacerbating the Yemeni conflict. “Iran has relations with the Houthis, as it provides them with weapons and specialists, and Iran is one of the main reasons behind the war in Yemen,” Foreign Minister Adel al Jubeir said in October. In his address to the U.N. General Assembly, Jubeir said Riyadh wanted good relations with Tehran, but also called on it to stop interfering in Arab affairs. Saudi-Iran tensions flared again in September when hundreds of pilgrims – including more than 400 Iranians – died in a stampede during a Hajj pilgrimage in Saudi Arabia, home to Islam's two holiest cities. Bahrain announced in July that it had foiled an arms smuggling plot by two of its citizens with ties to Iran. Citing hostile Iranian statements, Manama withdrew its ambassador from Tehran. Iran’s foreign ministry urged Bahrain to deal with its own domestic issues and have a serious national dialogue instead of playing a “blame game.” In August, Bahraini authorities arrested five people for alleged links to Iran in connection with a bombing that killed two policemen. In October, Bahraini security forces reported they had found a large weapons cache including 1.5 tons of C4 explosives. Bahrain’s foreign affairs ministry said it recalled its ambassador in Tehran “in light of continued Iranian meddling in the affairs of the kingdom of Bahrain ... in order to create sectarian strife and to impose hegemony and control.” The foreign ministry also gave Iran’s acting charge d’affaires three days to leave Bahrain. In November, Bahrain arrested 47 members of a group allegedly tied to “terror elements in Iran.” A public prosecutor said five individuals had communicated with Iran’s Revolutionary Guards. They were stripped of their citizenship and sentenced to life imprisonment. Iran’s relationship with Turkey in 2015 was characterized by both rivalry and cooperation. The biggest challenge facing the two was how to resolve the Syrian crisis. Ankara sought the removal of President Bashar al Assad while Tehran significantly upped its military presence in Syria to shore up his regime. Turkey also supported Saudi Arabia’s air campaign against the Houthi rebels in Yemen. Iran, widely seen as a backer of the Zaydi Shiite movement, condemned the intervention as a violation of Yemeni sovereignty. In March, Turkish President Recep Erdogan accused Iran of trying to dominate the region and foment sectarianism. “Iran has to change its view. It has to withdraw any forces, whatever it has in Yemen, as well as Syria and Iraq and respect their territorial integrity,” he said at a press conference. Several Iranian lawmakers called on their government to cancel Erdogan’s April visit to Tehran, and one said Erdogan was trying to rebuild the Ottoman Empire. Despite tensions, Erdogan made the trip. He and Rouhani signed eight agreements and focused on boosting economic cooperation. The two have been close trade partners for years. Iran accounts for some 20 percent of Turkey’s gas imports. A bilateral preferential trade agreement went into effect in January. Throughout 2015, the two sought ways to double their annual bilateral trade volume to $30 billion. Turkish Finance Minister Mehmet Simsek said the nuclear deal, announced in July, was “great news” for the Turkish economy and bilateral trade. In December, the gulf between Turkey and Iran seemed to widen further. Erdogan again accused Iran and Iraq of pursuing sectarian policies in an interview with Al Jazeera. He justified the presence of Turkish troops in northern Iraq by citing the local needs of Sunnis for arms and self-defense training. “What will happen to Sunnis? There are Sunni Arabs, Sunni Turkmen and Sunni Kurds? What will happen to their security? They need [a] sense of security,” said Erdogan. Turkey also joined a 34-state coalition of solely Sunni states, led by Saudi Arabia, to fight terrorism. Shiite Iran’s exclusion from the group highlighted the deepening sectarian divide.